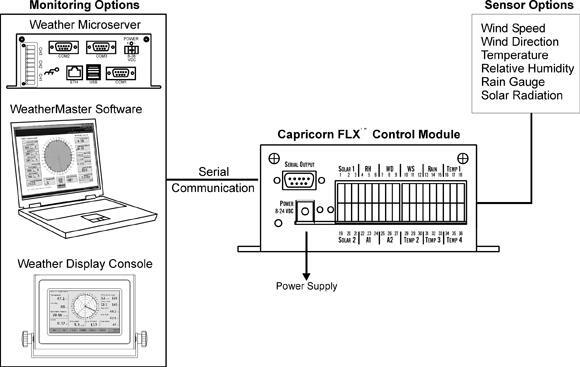 Shown above - Capricorn FLX Weather Station with Control Module and optional Weather Display Console to create a complete industrial grade weather station. Standard Capricorn FLX weather monitoring system includes the Control Module with internal barometric pressure sensor, wind speed and direction, temperature and humidity sensor housed in a solar radiation shield. A custom sensor package can be built using any sensor combination including up to four temperature sensors and two solar radiation sensors.